Well, it seems that the last video has been posted for the Ticket to Venice class, which makes me very sad because the whole experience was quite magical. If you haven't signed up you still can, all the posts are in chronological order and the instructions are neatly kept on a separate page, and the chatter is still active on the private Yahoo group. The videos of Venice are just gorgeous, so inspiring. And you saw my book so you know how wicked awesome it is. I needed a small journal for a dedicated project, and so I went back to Mary Ann's Full Tilt Boogie (and her class is on sale!) 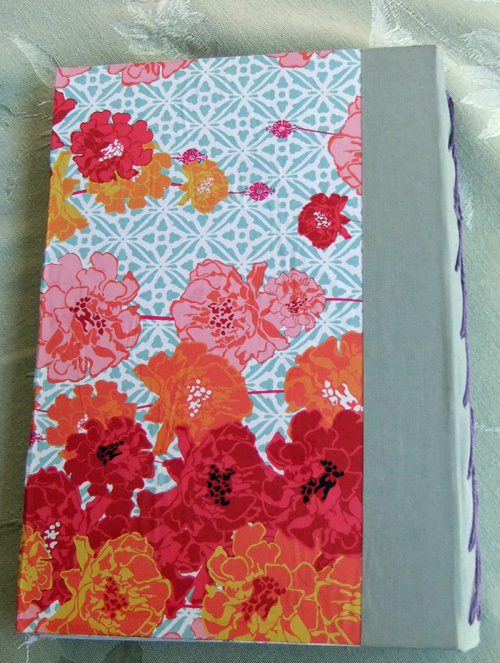 and created a journal using the third binding she taught. And I finished sewing it while watching Laurence Olivier's Hamlet. This is the binding ... it's called Triple Chain stitch. The first signature is all ledger paper (plus that large security envelope), the other two are canvas with some more ledger paper for additional notes. Have you made anything this past week or two? Lovely! I'm "a-thinkin" about trying it. But it will have to be after egg season. That starts Feb. 14. Come play!!! Leanne, this is so beautiful! I love your stitiching, and the purple thread, too! This is so cheerful... I love the cover paper. My favorite colors! And the stitching is perfect with a good choice for paper for the pages! I have yet to complete ONE journal but hope to get there someday. Thanks for the inspiration! Hi! I came across your blog by way of the full tilt boogie posts. 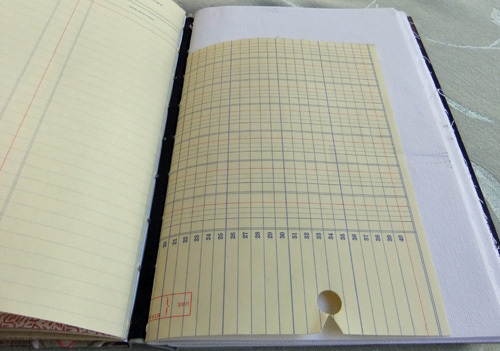 Nice journal, love the ledger paper. I have come to use a lot of vintage book text since making the full tilt boogie journals. I also wanted to say how much I am uplifted by your sharing the message of love and hope. Thanks! 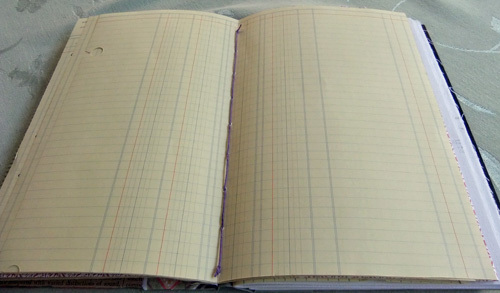 Leanne, your journal is really beautiful. Love the papers you used in it. Thanks for sharing. 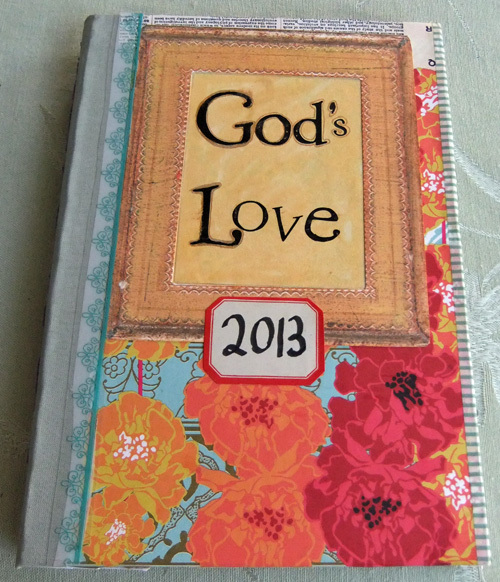 Thank you for sharing Leanne - this journal is beautiful and the binding is awesome! I love that floral paper. 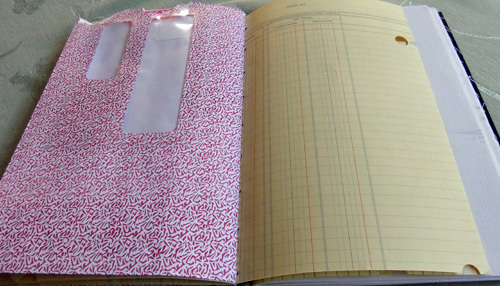 A wonderful journal Leanne - love all the ledger papers you have used and the envelope too.